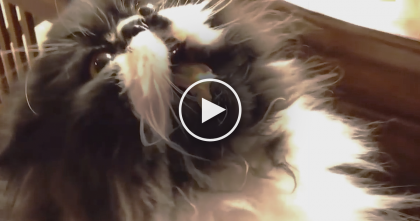 This adorable fluffy kitten stands his own ground after meeting the doggie and even learns how to hiss and the dog is very surprised, but when mother hears what’s happening, she comes to the rescue! 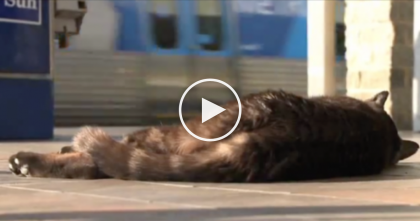 It doesn’t even matter that this kitten would like to deal with things on his own, mother knows best and rushes her to a place where there are no dogs! Massive Muscular Black Tom Cat Found On Streets Visits Vet Ranch For Neuter And Checkup, WATCH. Kitty With A Monkey Suit Eating His Favorite Snack…I’ve Never Seen Anything Like It, LOL!! 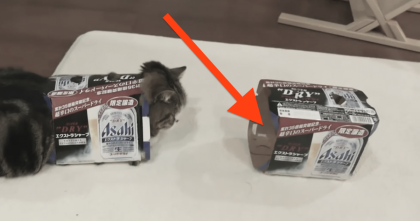 Maru Is Sleeping In A Box, But When He Sees Another Box, THIS Happens… LOL.